There is now a new Heavycoin (HVC) cpuminer available compiled for 64-bit systems that offers increased performance with up to about 30% than the previously available miner. This version of the miner has been compiled from the source code of the 1GH pool modified miner, they don’t yet have it available as a binary on their HVC pool. We have tested it and it indeed works better and offers higher performance (depends on the CPU used), so if you are mining the Heavycoin crypto, then you should update your miners. Note that there are some people that claim to have already working GPU miners for HVC, be wary of such people asking you to pay for the miner with crypto as it is most likely a scam! There is currently no GPU miner available for Heavycoin and though it might be possible for such, none is available for the moment at least. 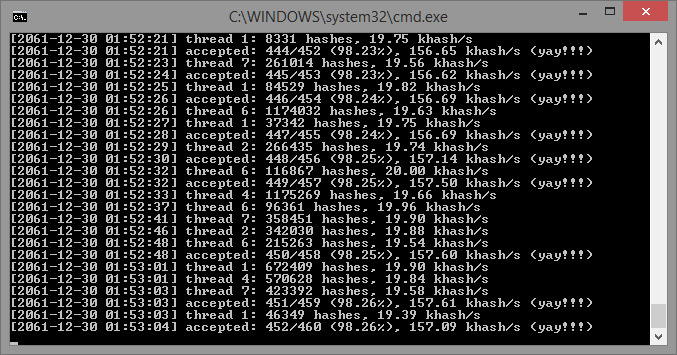 Meanwhile you can update your CPU miner to get some extra boost in the hasrate you are already getting from your miners. Also note that the current reward per block for HVC has been increased to 861 for the moment from the previous award of 657 HVC per block, so you will be mining more coins because of that as well. 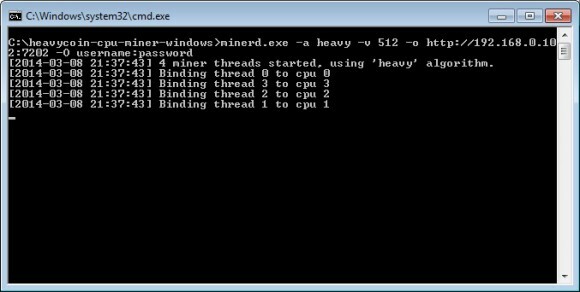 Heavycoin (HVC) is a new CPU only mined crypto currency that is just launching/launched and we have compiled for Windows the modified cpuminer software that you can use aside from the wallet to solo mine the coin at launch, while the official pools start working properly. Heavycoin uses a new algorithm called HEFTY1 that makes the coins a promising alternative to the likes of Primecoin (XPM) as a crypto that can only be mined on a CPU (at least for now). You can use the miner to solo mine on Windows systems after HVC mining officially starts on March 8th 12:00 UTC. The archive also includes a version of the minerd for the http://hvc.1gh.com/ pool, so far the only working pool for Heavycoin. Note that the pools apparently uses a specially modified version to work for them and it might not work on other pools, that is why we have included both versions in the archive.